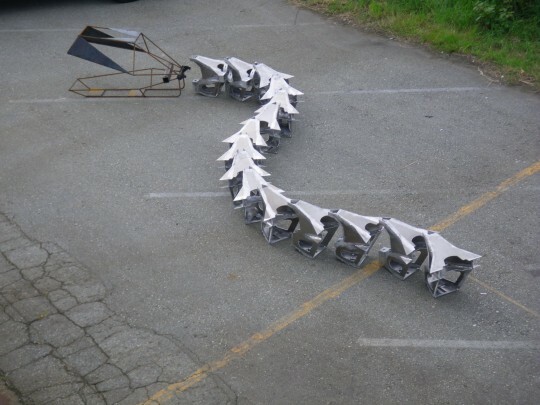 The Black Rock Arts Foundation has asked Charlie Brinson and crew to create Titanoboa: a 50ft hydraulically actuated and semi-automatically controlled snake made from aluminum and powered by lithium polymer batteries. A team of electronic engineers are designing Titanoboa so that her movements anatomically mimic those of an actual snake. They are devising a plan for her to be controlled by a lone rider who will sit on a saddle just behind her ferocious head. Named after the ancient serpent that roamed the earth over 60 million years ago, Titanoboa will be slithering through the Playa this August, delighting and frightening Burning Man visitors. 60 million years ago, in a sweltering climate 6 to 8 degrees warmer than today, there lived a monstrous snake called Titanoboa. These temperatures, which are at the upper end of climate change projections, allowed this cold blooded brute to reach its size. The Titanoboa project seeks to reincarnate this 50 foot, 1 ton beast as an electromechanical serpent meant to provoke discussions on our changing climate in a historical context. This giant reincarnation will roam the earth striking terror in the hearts of those who dare to look into its eyes and contemplate the future of our planet. How will your contribution help Titanoboa? With the help of a successful Kickstarter campaign, the Titanoboa team will be able to build elaborate scales to protect the snake’s electronic insides and purchase control components to help her slither more gracefully. The Kickstarter campaign will also help Titanoboa to grow… her size is not limited to 50 ft and the larger she is, the better she’ll look and perform. The more money we raise, the more grandiose, sophisticated and agile she’ll be! !